NEW PAY STRUCTURE : The present system of pay bands and grade pay has been dispensed With and a matrix has been recommended. The New system is an extension of system Of Pay Scales, albeit, with a progressive Increment of 3% instead of fixed Increments. 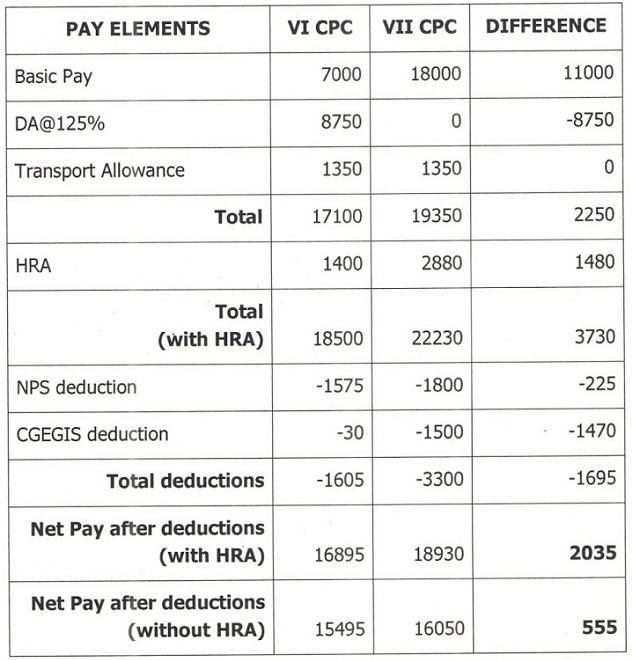 Unlike VI CPC, Minimum pay fixed on promotion is at par with the initial pay fixed direct recruits in the same grade. However, the fixation benefits on promotion, particularly from Level 2 to 3, 3 to 4 & Level 4 to 5 is significantly less compared to VI CPC Structure. National Council JCM demand of fixation benefit of two increments Should be reiterated or at least 5% should be ensured. A comparison of the promotion benefit for the after 10 years of service in their respective grades is given below.